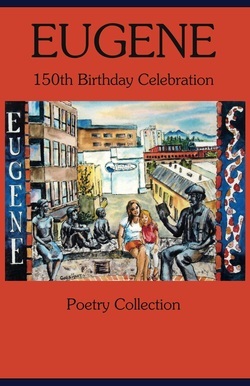 This poetry anthology was created to celebrate Eugene, Oregon's Sesquicentennial in 2012. Jointly published by Arrowcloud Press and Groundwaters Publishing in association with the Eugene, Oregon Public Library. The work of 30 Oregon poets (including C. Steven Blue) and two Eugene Artists are featured in this unique collection of Eugene themed poetry. Proceeds from the sale of this book benefit the Eugene Public Library for its continued support and fine work in our community. This special poetry anthology contains at least one poem from each poet who submitted their work. Young and old, new and experienced poets contributed to this unique book and to the event. Some of the work published was inspired by the library's Summer Reading Series Poetry Workshop & Poetry Showcase, held in July, 2012 and hosted by C. Steven Blue. Copies of the book were awarded to each of the participants and presented to the Eugene Public Library at the event.